Quinacridone Gold could be considered a non-essential colour, but it very quickly became one of my personal go-to favourites when I first tried the Daniel Smith PO49 version back in about 1995. I think it was the first company to produce the colour, and I loved not only the way it mixed, but also the gorgeous glow it could add to a painting. I've also tried a PO49 version from Winsor & Newton, but otherwise only hues from other manufactures. It is brighter than most earth yellows, but more neutralised that most warm yellows so is a neutralised warm yellow. It's perfect for making the gorgeous dull greens of the Australian landscape. Since PO49 has run out, I thought I'd post up a sample of different versions for comparison. The first has the yellower Nickel Quinacridone Gold from M.Graham, followed by the new (2017) Schmincke Quinacridone Gold Hue and the QoR Quinacridone Gold. PY150 is a perfect base for this colour hue and it appears in all versions. M.Graham Nickel Quinacridone Gold, Schmincke Quinacridone Gold Hue, QoR Quinacridone Gold. Next are Quinacridone Gold Hue from Daniel Smith introduced in 2015 for 5ml tubes and sticks, and now used in 15ml tubes. This hue was used in the mixes (including Sap green and Undersea green) from that time instead of PO49. Next shown are the genuine PO49 from Daniel Smith and the genuine PO49 from Winsor & Newton (also no longer available). And finally the Winsor & Newton three pigment hue which looks ok in this sample but is often very dull, the three pigment Sennelier hue and the deeper and more orange Da Vinci hue. Winsor & Newton Quinacridone Gold, Sennelier Quinacridone gold, Da Vinci Quinacridone Gold. They are all very similar, though the W&N is less bright due to the PV19 and the Da Vinci is deeper - almost like a PO48 Quin Gold deep. As always, it's hard to show on the screen. My favourite mix is PY150 plus PR101 (DS transparent red oxide, DS Burnt Sienna Light or W&N burnt sienna) that Schmincke uses, though PR206, PO48 and also work. I'll also show these pictures on Instagram (Janeblundellart) where they may look slightly different. Edit January 2018 - The dry samples I had noticed (mentioned above) were from Guerra Pigments in New York. Thanks to RiverdaleWatercolor who commented below, here is a sample of the Guerra PO49 pigment compared with Daniel Smith PO49. Apparently this took some hours to mull to get smooth enough for watercolour, but there is also a dispersion available which may be more suitable for home made watercolours. It certainly looks beautiful on the screen if you click on the link. Daniel Smith PO49 (left) compared with Guerra Pigments PO49 (right). As far as mixing is concerned, the Guerra pigment behaved more like a raw sienna. 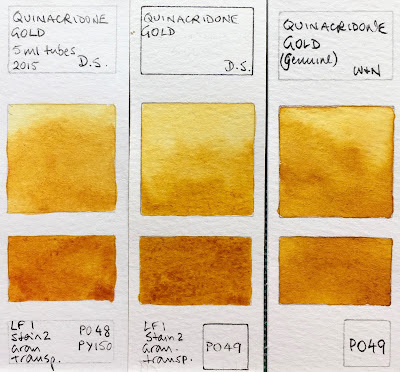 Edit March 2018 - Riverdale watercolours sent me a sample of her hand made Quinacridone Gold made with the Guerra dry pigment and it's quite something! Not what I expect for PO49, but very beautiful with extreme granulation. It is almost a burnt sienna colour. If you are using my ultimate mixing set, you can also create a very nice Quin Gold hue by mixing hansa yellow medium with burnt Sienna. However I think the DS hue is close enough to still be a useful colour in the palette - it will still mix gorgeous greens and provide a beautiful warm glow. LOL. I started hoarding them too. At first I would just buy 2 or 3 if I needed one new tube, knowing this color was on the endangered list. Then this last summer I noticed that it no longer appeared on the Daniel Smith website. I feared for the worst and bought a half dozen at a time from my favorites suppliers. I think I have a lifetime supply now as I use it a lot, both as is and for mixing. Who knew they could go through a warehouse full of that pigment so fast. I have a few precious tubes and sticks of the PY153 too. Perhaps at some point in the future the car manufacturers will decide to bring one or both of those colors back. There will always be taxis needing to be yellow. What I'm really keeping an eye on are the Primateks. There are a few I used quite a lot and will need to stock up if they ever decide to discontinue or for one reason or another can no longer source the raw materials from the area in the world from which they originally could. I have a few tubes of malachite and azurite before they discontinued them. The only color I've been really disappointed in is their Lapis Lazuli, but that is because they must source an inferior grade from a less politically volatile area of the world and I totally get that. It's also really expensive. I actually prefer the azurite. I could be wrong, but I think Daniel Smith's Lapis Lazuli might be made from the whole stone rather than washed grades of pigment, I seem to remember seeing a post by someone who got better color out of their tube by washing theirs? It makes sense, the better grades of Lapis Lazuli are insanely expensive, I doubt they could sell the paint so cheaply if they used a better grade of pigment. You might try it if you still have yours. Yes, it is made from the whole stone, although they said it isn’t. I read that blog post about washing the D.S. Lapis Lazuli and was even going to try it. Then I was going to try the Greenleaf and Blueberry lapis but it’s one of their special edition colors and it’s also $150 for a half pan. Yikes. Was going to buy some from Natural Pigments and they’re out. I recently bought a half pan of what is advertised as genuine lapis from JazperStardust on Etsy. It arrived yesterday and I did a little swatch of it and it is beautiful and seems like the real deal, even though the price seems too good to be true. I’m going to ask her about her “copper turquoise”. I’ve put it in my pans with my Greenleaf and Blueberry. I’ll see how they compare and may be buying more from colors on Etsy. Matteo Grilli still makes half and whole pans of “indian yellow” with PY153. Check with him first before you order to see if he still has it. I've ordered Matteo Grilli's watercolours - he doesn't have a big range but does a nice job. I also bought a jar of Schmincke PY153 so I have it when I eventually get around to trying to make some of my own colours. Some day! Guerra Pigments has some dry pigment available, although it is a bit expensive. Be warned though, it is difficult to mull, and the color is dull unless it's mulled very thoroughly. I had to work on mine for several hours before my paint was completely smooth. Thank you for the feedback - yes it was Guerra Pigments that I had seen but not tried it. Once thoroughly mulled, how did it compare with commercial PO49 watercolours? I only have Daniel Smith's PO49 to compare it to, but it seems to me that even mulled very well it is duller and more earthy. I'll paint out some swatches to send you when I have a minute. Guerra also has it available in liquid dispersion form. I find those are sometimes brighter because the pigment has already been thoroughly dispersed, a lot of the work has been done for you. I don't personally care to work with them very much because my recipes are based on powdered pigment and for me at least, it's harder to get the right ratio using dry gum arabic and liquid pigment. So I haven't bought their Quinacridone Gold dispersion, but it might be worth trying. Thank you for the sample of the Guerra pigment - I've added the swatch to the Blog post, along with your comparison swatches. It is completely different from the DS version but is rather gorgeous in its own right! I've watched that video before, it really is amazing! I remember reading somewhere that the best blue color might make up only 1% to 5% of the stone, that's a lot of crushed lapis needed just for a tiny bit of blue. I've only been able to afford low to middle grades myself so far, but even so they're beautiful. I'm very thankful we have synthetic ultramarine blue available now though! I agree - I love ultramarine! I'd be rather lost without that to throw around. This is all news to me. I’m crushed! I use quin gold constantly and now I have to find a replacement color. What a bummer!! Thanks for your thorough blogs on color. If you are quick you can buy up to two tubes here! From Australia. Hi Jane! I think I found a better Quin Gold hue mix: PY150 + PBr25. It makes surprisingly glowing mixes compared with Daniel Smith's hue mix. There's something special about DS's permanent brown! An interesting mix to try - good idea - yes it is a glowing reddish brown.